It was a broken curling iron that changed the course of Julie Saunders’ life. New to D.C. in 1983 and one week into a job at the Madison Hotel, she walked into the old Bell’s store in Georgetown to buy a replacement. There, Julie ran into an older Austrian man whom she’d briefly met at the Madison. She didn’t know it at the time, but it was her first—and most important—test. ‘I know that I know nothing,’ said Plato. ‘But I’ll find out,’ would add a concierge. Julie did just that. Two years later she was director of private dining at the Jefferson Hotel, but a change in management left her without a job. A friend at the Madison convinced her to come back as a concierge. Julie took a leap of faith and learned as she went, frequently calling The Four Seasons concierges for help—never guessing she’d be one of them eight years later. Today, Julie is only the third Chef Concierge since the five-star hotel opened in Georgetown—and the first woman to earn the title. She’s as unflappable as you’d imagine is required for such a role, yet every request is treated with the same sense of urgency. Like macadamia nuts, most recently. Mauna Loa, to be specific—needed the next day. Julie had only ever seen them in Hawaii, so she started researching with a colleague. Mauna Loa could get the nuts to D.C. in two days, but that wasn’t fast enough. On to Plan B. Technology has sped up such problem solving—one Google search replacing four phone calls. 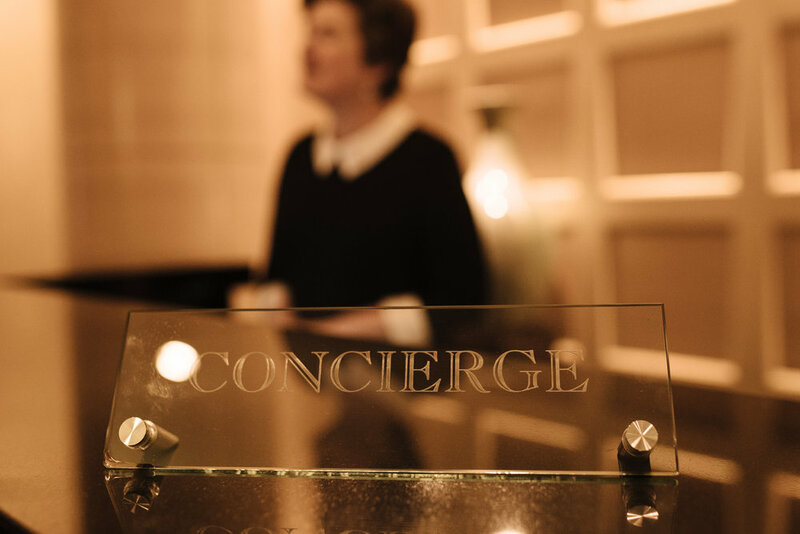 But it’s also challenged the value of a concierge, something Julie has had to reconcile. Julie still makes most of her reservations the old-fashioned way. She picks up the phone. Though she’s often tethered to her desk, Julie’s experiences outside of The Four Seasons have provided some of her most beneficial professional development. Deeply spiritual, Julie has meditated every morning for 25 years—a necessary practice when your entire day is spent solving unforeseen challenges. During a morning meditation in 2009—after several trips to Brazil, often to see healers—Julie received an invitation from the most famous of them all. An inner shift, and an even deeper understanding of the South American country that would soon serve her well. Back behind The Four Seasons desk, Julie met a well-known actress from New York City who was in D.C. to get a visa—a requirement for all Americans traveling to Brazil, which she’d only learned after she couldn’t board her flight at JFK. Julie not only arranged for a car to the embassy, but called on the connections she’d made during her many personal trips to have someone meet the actress when she arrived in Brazil. That’s been the story of Julie’s entire career, really. A series of little big things.